Our voice is our identity. It is both our deepest, inner self, and a means through which we engage with the world and from which others form an impression of us. The ancient Greeks said that “as men’s life is, so is their talk” – our voices seem to echo precisely everything that we are. This is presumably what prompted Socrates to say, “Speak, that I may see you,” and prompted the title of Boone’s book, ‘Is your voice telling on you?’. Our voice is also an expression of our power. Through our voice, we can claim our place in the world. The energy and sound of our voices can have both positive and negative intention and impact, as can our words. The voice and the person are indivisible. As Stengel and Strauch say, ““work on the voice, whether conscious or subconscious, is always also work on the self”. Andrews writes: “No problem exists in a discrete form. Any problem that affects the ability to communicate creates social and emotional difficulties. Similarly, social and emotional problems can themselves create or exacerbate communication disorders.”Effective development of voice and communication skills therefore needs to take account of both the physical dimension of voice (how the body produces the sound most efficiently and healthily), and the personal dimension (the inner landscape of the person, and their social and relationship context). 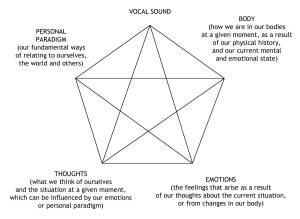 It can be useful to think of voice and communication with a five-part model that can be represented by a pentagon. First of all, it is important to realize that although we use the word ‘voice’ a lot, actually, there is no such thing as a voice. There is no physical object we can point to and say, ‘there it is, that’s my voice’. More likely, when we talk about someone’s voice, we are referring to the acoustic phenomenon, the sound that our listening brains interpret as voice and, of course, language. So, the first point on the pentagon is called VOCAL SOUND. If we want to have any influence on our vocal sound, we cannot change it directly; we have to look to other points on the model. Vocal sound is an acoustic event in the physical world, and is produced through physical means. So, the next point on the pentagon is the BODY. The physical process can be simplified into three components: the breath mechanism (which is governed by many muscle systems, and influenced by how we align and move ourselves); the vibrating source (the vocal folds, the structures that surround them, and the muscles that act most directly on them); and the resonating system (the structures and muscles that influence timbre, resonance, and articulation, the conversion of the raw sound signal – the ‘note in the throat’ – into words). Our biological inheritance, our genetic make-up plays a role in the sounds we can make, but is the least significant element. A great voice is not so much about the accident of genetic inheritance, but how we use what we have. An important part of all vocal training happens at this physical level. There are sound anatomical principles that govern the healthy and free production of vocal sound. It is useful to be able to distinguish these sound and logical methods from the mass of misinformation and incomplete understandings that abound in the voice training world. Any good voice trainer should be able to describe exactly in precise detail the physical basis of what is happening, and why something works. Effective physical technique can also enhance the delivery of what we want to say. Knowing about the physical basis of producing vocal sound is not sufficient in itself to have a free, expressive or interesting voice. Our voices can still let us down however good our physical technique is; so too, we can sometimes regret the words we choose in a given moment. This is because what we do with our bodies is deeply influenced by our EMOTIONS. 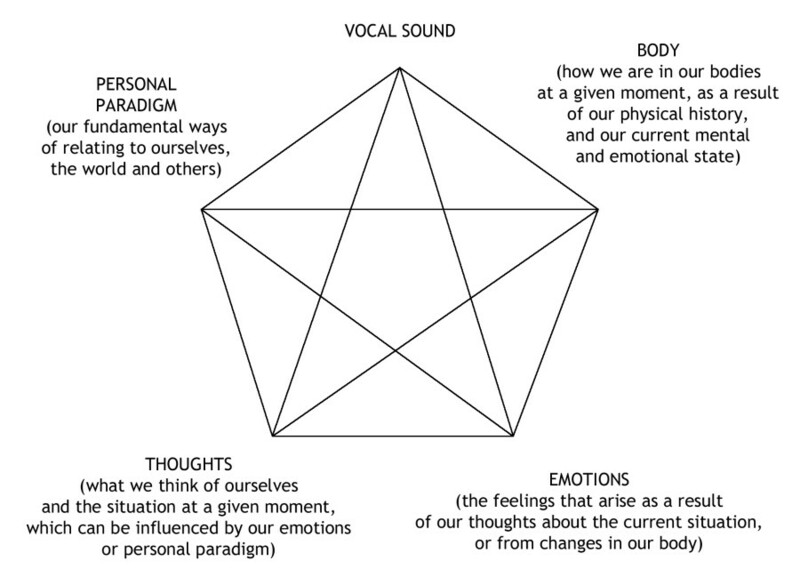 Without having to consciously plan, our vocal sound immediately reveals feeling. A person’s facial expression or how they are ‘in their bodies’ arises from how they use their muscles – this indicates something both about their personality and their current mood. Our emotional selves, and emotional history, are mapped into our bodies. To master our voice, we must master our bodies; to master our bodies fully, we must master our emotions. Emotions clearly have a physical dimension – they are always felt in the body, albeit sometimes subtly. Emotions also always have a cognitive component. With practice, we can track through our internal process, and discover that there are THOUGHTS that are triggering our emotional states. For example, it is not difficult to recognize which thought process will serve me better – ‘Will I speak well in the next few moments, or will I make a complete fool of myself?’ or “Whatever happens now, whatever sounds / words I emit, whatever responses come from others, none of this has to affect my internal equilibrium.” As well as affecting our emotions, our thoughts can also directly help or hinder the conscious instructions we give to our bodies in the physical technique of sound production. How we think about the situation also governs the words we choose. The fifth point on the pentagon represents the ‘ground’ from which our thoughts arise. This is our personal PARADIGM, which includes our fundamental view of ourselves, our beliefs about how the world works and what our place is within it, and priorities. For example, when I have a secure sense of self, and can meet with courage, honesty and compassion those parts of myself that once I might not have wanted to admit existed, then I am likely to engage with others with a much greater open-mindedness, vitality and confidence – and I will be able to maintain my equilibrium regardless of how others behave towards me. I need to have a fundamental trust in the idea that the world is not a hostile place, or that even if people are out are out to ‘get me’ (or, for that matter, put me on a pedestal), I can remain psychologically and emotionally intact. My thoughts will reflect this, as will my emotional state. My body is then, relaxed, vibrant and fluent. My words are likely to be well chosen, positive, and engaging for the listener, and my vocal energy will be at its best. We have taken a journey anti-clockwise around the pentagon, but there is a reciprocity between all the different parts of this five-part system. Physical processes, such as breathing, relaxation and postural alignment techniques, can help change our emotional and mental state. Physical movement, and deeper breathing triggers endorphins in the body, lifting our emotional state, and we find ourselves thinking more positively. Sounds can influence our inner life (as shown, for example by music therapy, and the importance of music in all our lives). There is a large body of scientific evidence that shows how sound (which is a type of vibration) can also directly affect our bodies. We can shift our paradigm either by ‘changing our mind’ or by a spontaneous internal ‘realignmnent’ arising from the direct impact of sound. (Have you ever experienced a complete change in outlook from simply being receptive to prolonged sound meditation, or a piece of music?). all voice and communication work is about coming more into our true selves, and then moving ‘out’ again into voice and communication. The core principle underlying all the work is that changes in vocal and communication behaviour imply a systemic change in behaviour. For all behavioural change to be authentic, consistent and sustainable (so that we reach ‘unconscious competence’), we must be prepared to be different. In practice, this means becoming more ourselves, believing in what – and who – we have to offer, and being willing and able to operate from ever deeper levels of integrity. When we achieve that, our confidence is at its highest, and we can learn to master vocal and other skills easily. Such systemic change work takes time and sustained commitment. Most importantly, we must be prepared to work on the ‘inner game’ and personal issues that inevitably arise in voice and communication work. Working on the ‘mechanics’ of voice production can provide the scaffolding for this work, but rarely on its own produces satisfying results. This five-part model offers an approach that creates significant and lasting change by working with the whole person – mind, body, emotions, and values.